I thought I would write a post about things you can do in a typical day to save money. Wake up: If you have kids, consider buying 1 ply toilet paper instead of 2 ply. It could cut down the cost. Breakfast: Eat store brand cereal instead of name brand cereal. 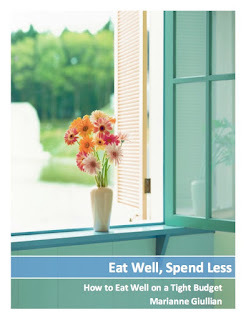 Better yet, eat oatmeal and save even more money than either of the cold cereals. You also don't have to be concerned about what is in the cereal you are eating. Instead of a whole banana, which is two servings, consider eating a half banana instead. Instead of pouring a large glass of orange juice, have 4 ounces and then drink water if you are still thirsty. We don't drink coffee or tea, but for those of you who do, consider making your own instead of buying it on your way to work. Dishes: Use less dishwasher soap than the package calls for. I usually put just about 2 tablespoons. My liquid dishwasher soap was almost finished, so I turned it upside down and will get at least 2-4 extra washes. Skip the heat cycle on your dishwasher to save on energy. Shower: Use half as much soap or shampoo as you normally would. If it is a challenge, try filling up the container with half soap and half water. Reuse your towel instead of putting it in the washer after one shower. Clothes: Hopefully your closet has clothes that fit you. People wear about 20 percent of their clothes 80 percent of the time. Try turning your hangers the opposite way and as you use an item of clothing, turn the hanger back to the right way. This way you can know what you really are wearing. After 3-6 months, sell the clothes you don't use. This money can be saved until the next time you need clothing replaced. Let your old clothes pay for your new ones. Lunch: Bring your lunch to work. You can save lots of money this way. If time is an issue in the morning, prepare your lunch the night before. If you are set on buying lunch, find lunch specials and order from that menu. Save half of your lunch for the next day or for dinner that night. Activities: For kids, instead of paying to go to the movie theater, rent a movie through Redbox that is much cheaper than going out. Have kids play outside or turn on a sprinkler to cool off instead of paying to go do activities that cost money. Laundry and other cleaning: Make your own non-toxic cleaners. Use rags instead of paper towels to clean. For laundry, wash what is dirty or smells. Wash full loads. Use 1/3 to 1/4 the amount of soap called for. Errands: Write down the errands that need to be done for the week, and find the best route to get them done in one trip. This will save you time and gas. Dinner: Make it yourself. Plan meals according to your schedule so you will not be tempted to eat on the run. Eating out really ads up. Bedtime: Use less toothpaste on your toothbrush. Don't leave the water running when you brush your teeth. Use a wash cloth instead of disposable cloths on your face. Wear the same pajamas more than one day. What are some simple things you do each day to save money?